Huesca's pre-Roman Iberian name was Bolskan. It was the capital of the Vescetani, in the north of Hispania Tarraconensis, on the road from Tarraco and Ilerda to Caesaraugusta (modern Zaragoza). The city's name was rendered as Osca, and was a Roman colony, Urbs Victrix Osca, during the Roman Empire. 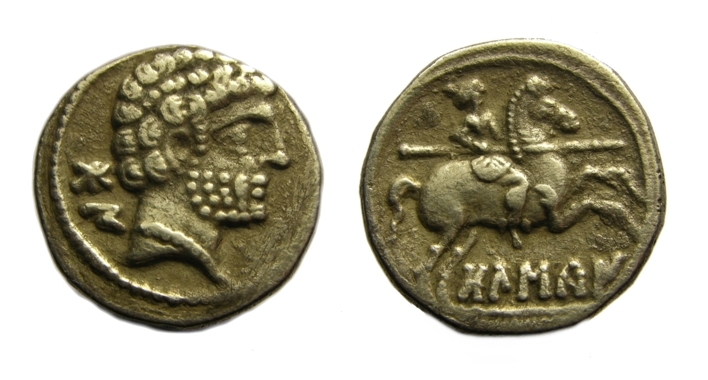 Under Quintus Sertorius, the renegade Roman and Iberian hero who made Osca his base, the city minted its own coinage and was the site of a prestigious school founded by Sertorius to educate young Iberians in Latin and Romanitas in general. Obvs: Male head right, Ж٣ behind. Revs: Horseman holding spear right, ЖΓMA٢ below.